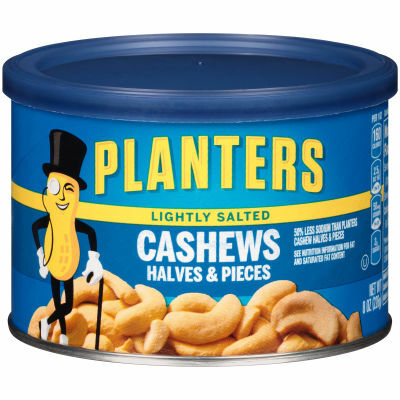 Planters Cashew Lightly Salted Halves & Pieces for Smart Snacking - When you're looking for a little something to help you make it to your next meal, or you want to bolster your brown bag lunch with a little nutty flavor, turn to Planters Cashew Lightly Salted Halves & Pieces. Nutrient-Rich Cashews - Cashews have been called the heroes of wholesome snacking. These cashews will provide multiple vitamins and minerals and fiber but no cholesterol so they're a perfect alternative to the empty calories of most junk foods and are ideal for people on salt-reduced diets. Enjoy these Planters Lightly Salted Cashew Halves & Pieces cashews whenever you have a snack food craving for nutty good taste. Serving size 1 oz (28g/about 50 pieces).